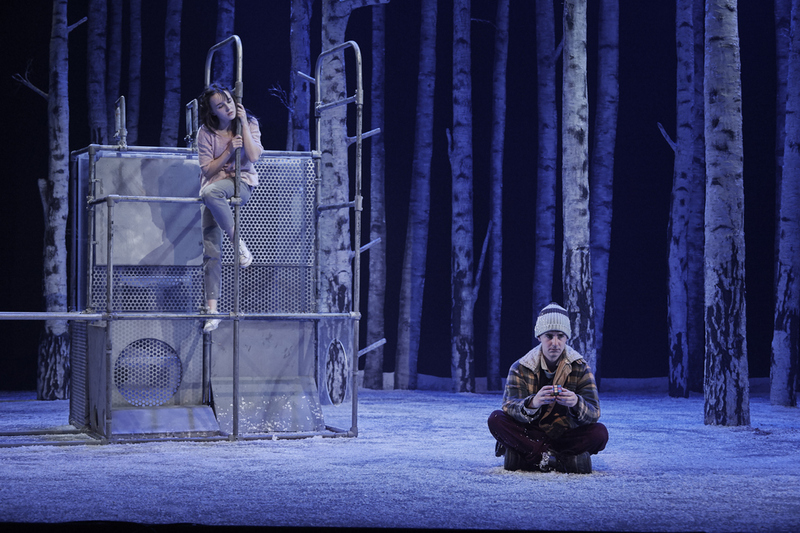 I was told that, due to the grisliness of the piece, someone fainted during one of the previews of “Let the right one in” at the Abbey Theatre. After seeing the show on the opening night, I don’t take that as an exaggeration. Horror is hardly seen in theatre and for reasons that are easy to imagine. As the genre, especially its gory variant, relies heavily on graphic special effects, it’s not surprising that it would be ignored by producers. “Let the right one in” by director John Tiffany, completely dismantles the notion of horror being unsuitable for theatre through the use of amazing special effects, forcefully pushing the boundaries between theatre and cinema and bringing right in front of you, in flesh and bone (and lots of blood), the scariest of scary vampire imagery. Katie Honan’s physical enactment of the young vampire is also truly astonishing and terrifying. 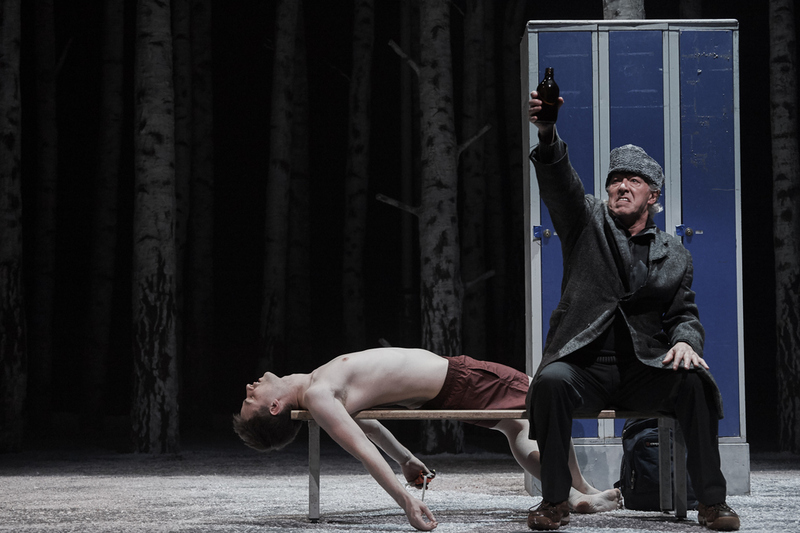 This production packs a commercial punch with a script based on the eponymous acclaimed Swedish film by Tomas Alfredson which in turn was based on the novel by John Ajvide Lindqvist. It plugged into the mainstream teenage vampire cult and delivered the goods to its target audience through the aforementioned special effects. 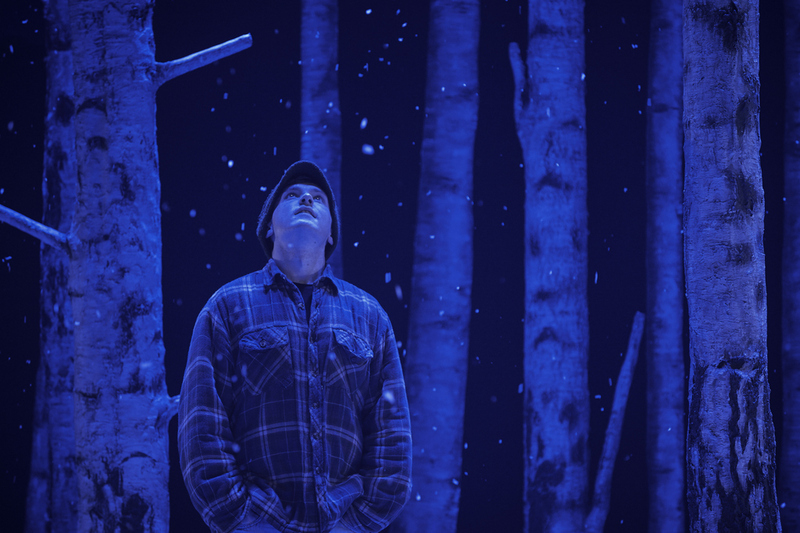 Each and every technical aspect of the show is impressive: from the eerie set made of bare trees, to the dynamic and nocturnal lighting design, to the booming sound design. The music by Ólafur Arnalds is particularly beautiful and exciting, mixing piano, cello and synth to underline the very different but coexisting shades of the story: the romance, the drama and the horror. There is space even for a Charles Trenet song. Like in all the best horror films and books (from George Romero to Stephen King), this horror tale has layers and folds aplenty in it, and it is about way more than the ‘scares’. All of the ghastly creatures that the artist’s mind manages to create end up paling in comparison with the real monsters, those who keep lurking and do not fear daylight, the familiar monsters of everyday life: bullies in the schoolyard, a controlling mother, the pains of growing up (the adapted script plays more explicitly than the film on the Peter Pan myth, with the young vampire rejection of commitment and inability to grow up). The real challenge of this adaptation turns out to be not the delivery of copious outpouring of blood at the right moment, but the replication of the film’s delicate balance between violence and innocence, horror and romance. The ingenuousness and sophisticated restraint so masterly achieved in the the film get lost in translation. An insoluble flaw is that the actors are older than the 12-year old characters they play. While it would be virtually impossible to find children that age able to replicate the exceptional bravura of the film actors, at the same time, by definition, it’s very hard to fake innocence. But there is another, possibly more insurmountable obstacle, which lies in the nature itself of the original medium. This is the kind of movie that does not lend itself well to theatre, as it is image rich and word poor. Its language is a specifically cinematographic one. That is why the spurious additions in the mother’s part are an almost needed change, and Ruth McGill’s performance is a highlight of the play. Does theatre need to compete with cinema to be current, or should it stay true to its own nature? Do we really need pyrotechnic effects to be moved, or do we just need, still after centuries, only good words delivered well? With all the shortcomings of this adaptation, what is left of the original is one of the ultimate readings of the story: when you love someone you take the good together with the bad. And, sometimes, the ugly. Eli’s voice was so irritating and misplaced that I couldn’t help laughing at its absurdity in parts. Overall the play was enjoyable but the film is far better than this adaptation.